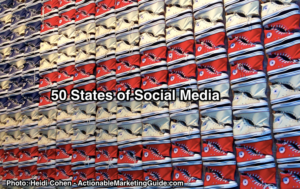 The post 50 Social Media Tips You Can Use Now appeared first on Heidi Cohen. Pretty much anyone who has chased a dream – launched a product, opened a business, set a goal – has experienced moments of fear. In some cases fear so gripping it derails, but mostly feared cloaked in some form of self-doubt that’s just strong enough to keep you stuck where you are. When I experience long stretches of uninspired effort and excitement, I know it’s time to revisit the essence of my dream. See, my dream only looks like building a successful business. It’s why I do what I do that’s at the core of my aspirations – and that’s what I must protect at all times. Reaching my dream requires that I get up every single day ready to fearlessly tackle the world of my highest priorities, even against the constant pounding of the world pushing against me. Sure, dramatic, but I’m guessing some of you know that feeling. When I do feel I’ve veered off the path or landed in a deep rut, I find my way back to center by assessing how I’m doing in the following three areas. This one is huge because at the core my business is about service. If I ever grip too tight on the idea of gain, I fall out of the balance it takes to serve. When I focus on giving – advice, mentoring, ideas, time, treasure – the universe seems to take care of what I receive. Experience tells me there is truth in this only if you can set the right intention for where you are headed and then detach from how you actually get there. I was having a conversation with a friend, and he asked me what I thought of those endorsement requests people send via LinkedIn. I told him I thought they were silly because nobody pays attention to those and why would I endorse someone I might not even know? I brushed his response aside, and then a day or so later it hit me like a ton of bricks. He said, sure, but what if a little thing like that meant a lot to that person? What if, they valued the gesture far more than you did – what would that cost you? It made me think about how easy it is in the rush of trying to grow a business or brand how easy it is to forget how easy it is to help other – even if they have no apparent way to help you. This is by far my greatest challenge. I want to be right, I want to have the answer, I can do it all myself. That’s what my ego tells me and in some instances, it’s what moves me forward, but it’s also a sure-fire way to miss incredible opportunities. People naturally want to help when their help is seen as needed, useful and invited. Letting go of being right, asking others for their opinion and being open and interested in the dreams of others is how you invite people and ideas into your dream that are equipped to help you strip away layers of fear and even elevate your vision to places you had not even considered hauling it. That’s all for today – thanks for letting me share! The daily deal site’s word-of-mouth strategy helps boost its high-value membership. Two thirds of supermarket baskets don’t include a promoted item, says the e-couponer whose new program looks to wring more sales circulars. Not long ago I wrote a post titled – Why Social Media Isn’t Working Anymore. In it, I shared my view of the role of social media marketing going forward. I’m not alone in this view as research certainly backs this up. A recent study by Social Fresh, called the Future of Social Media highlights many of the points I made in my recent post so I decided I would interview one of the creators and analysts of the study. 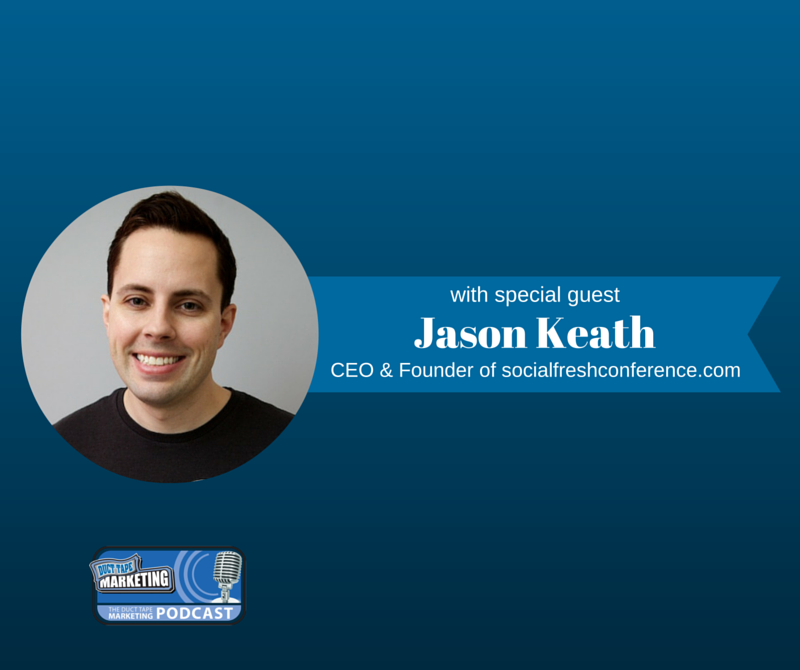 My guest for this week’s episode of the Duct Tape Marketing Podcast is Jason Keath, Founder and CEO of the Social Fresh Conference, speaker and well-known publisher of SocialFresh.com. Social Fresh is a site specifically designed to inspire social media marketers. Jason and I discuss the current and future trends of social media marketing. As a speaker and analyst, Jason regularly presents to audiences all over the world who are curious about digital marketing, creativity and how to make organizations more innovative. How has social media, and our relationship with it, evolved in the last 5-6 years? With respect to hiring for content positions, is the role of “Community Manager” still relevant? As people are shifting more toward the use of images versus elaborate content, are we giving away asset value and shelf life? Learn more about Jason Keath, his current projects and the helpful resources he offers. Click here to find out more about the Social Fresh Conference, which will be held in Orlando, Florida from August 18-21, 2016. You love games. I love games. Games are fun: they’re engaging and mentally stimulating. Our fondness for games is hardwired into our brains. Want proof that we love games? On top of this, over three quarters of American households own video games. VentureBeat put the number of American homes owning a gaming device at 80%. And it’s not just kids playing video games, either. In fact, the average age of gamers is 37. When was the last time you played a video game? If you’re looking to increase engagement, boost brand awareness, and generally make your content more enjoyable, gamification is a strategy you’ll want to implement. Gamification is a pretty nasty-sounding word, but don’t worry. I’m going to break it down nice and easy. provide some examples of the ways to apply it. I also want to be clear about one thing: gamification doesn’t always mean playing games. Gamification is a broader principle that’s about content engagement. If you were expecting a tutorial on creating Flappy Bird or adding Words With Friends to your blog, that’s not necessarily where I’m headed. Here are some definitions of gamification. Most people tend to agree that gamification is about game dynamics or game elements. Although gamification could be considered to be another catchy buzzword, the concept isn’t exactly new. In fact, it can be traced back to 2003 when it was coined by computer programmer and inventor Nick Pelling. However, it didn’t really catch on until 2010. That’s when it gained traction from Gartner’s prediction that more and more companies would begin gamifying processes to better appeal to consumers and increase customer retention. Look where we are now. Gamification is everywhere. The beautiful thing about gamification is that it’s fairly easy to implement. Plus, you can choose from a wide variety of approaches to make sure they mesh with your content. Here are some specific gamification techniques you can experiment with. You can experiment with these 7 gamification techniques to increase engagement and boost brand awareness. An innate desire that most humans have is the urge to compete. Deep down, many of us want to outperform the next guy and be the top dog. Leaderboards have long been a way of achieving status in the gaming world. Not much has changed even if today it’s Clash of Clans instead of Pac-Man. One method I’ve found to be effective at boosting engagement is having a leaderboard around my content. Let me explain. Say you’ve got a message board where your online community communicates and exchanges ideas. You could build a leaderboard that ranks each member by the number of their comments, replies, thanks, or other elements. If a particular person was in fifth place and not far behind the leader numbers-wise, this could definitely motivate them to keep commenting and engaging further. Leaderboards don’t always have to track person-to-person competition. You can use a simple leaderboard approach for featuring your articles. My simple content leaderboard on Quick Sprout shows users what blog articles are most popular, encouraging them to click through and read the blog. Leaderboards can take many shapes and forms. It depends on your creativity. Let’s be honest. We can all be a tad narcissistic at times. We like to unearth information about ourselves, figure out who we are and what we value, and often share it with others. Quizzes cater to this narcissistic tendency and can be highly effective at reeling in your audience. The best part is that many people will want to get their friends involved, which translates into more traffic. That’s a lot of sharing. Whenever you’re creating content, see if you can incorporate a quiz to encourage audience participation. They are fairly easy to design, and you can use a platform such as ProProfs Quiz Maker to create them. You may not believe in auras, and you may despise the Papyrus font, but aren’t you still a little intrigued about the color of your aura? Some of the most popular quizzes come from BuzzFeed. No surprise there. What might surprise you, however, is how appealing such quizzes actually are to people. You may be busy, stressed, and have a ton of things on your schedule for today. But a quiz about something as inane as serving sizes is somehow compelling. You want to play. Why? Because there is a subtle challenge to your smartness. You want to prove—whether to yourself or to others—that you’re darn good at knowing serving sizes. So, you take the quiz. BuzzFeed wins. They’ve successfully persuaded you to spend four minutes doing something on their site. If you haven’t tried it yet, I encourage you to use a site like ProProfs to make a quiz. It only takes a few minutes, and the results are huge. People also like to be rewarded for their efforts. I remember when I was in elementary school, my teacher would give me a star sticker as a positive reinforcement for doing something well. Whenever I amassed five stars, I would get a reward. Giving audiences virtual badges has become a popular way to reward people for the time and energy they invest. These badges tend to make people feel legitimized, and users can show them off to their friends. If you were trying to encourage readers to comment on your blog posts, you could give readers certain badges for the number of comments they left or for the length of time they contributed to a discussion. Many websites have implemented badges as a form of verifying celebrity status. Quora, for example, gives you a blue checkmark on your profile pic if you’re someone famous. You can gain similar status on some sites simply by being active, being helpful, and being respected. Search Engine Journal, a content-based site, applies gamification to the way it ranks its contributor base. Authors who contribute frequently with top-rated content are recognized with a “VIP contributor” badge on their profiles. This is similar to badges because it exploits people’s desire to achieve a certain status. But rather than using digital icons as rewards, you assign your customers, readers, etc. different levels according to their level of involvement. Maybe there are 10 different levels—10 being the highest. This could definitely motivate someone to participate and to become a more involved member of your online community. Testing ourselves pushes us to grow, progress, and become better versions of ourselves. You could challenge consumers to post pictures on Instagram showing unconventional ways of using your product. Or maybe at the end of a blog post, you create a scenario and ask your readers a question to see what they would do in a difficult situation. Many people will be compelled to take you up on a challenge, and you’re likely to see a significant increase in engagement. Moz used a gamification challenge feature to help users decide which tool they needed for a specific SEO issue. By clicking the checkbox of the issue they are interested in, users can get an instant display of the tool they should look into. Health challenges are a popular gamification feature. Some health challenges allow users to track their progress and customize their settings. Perhaps one of the most straightforward gamification techniques is to simply display a progress bar as a person completes a form or reviews a product/service. This shows people what percentage of the process they’ve completed as they move from step to step. People hate to leave things incomplete, so the desire to complete a process can serve as motivation to follow through to the end. You can use progress bars almost anywhere. As long as the user is focused on completing a task, there’s room for a progress bar. This kind of progress bar motivates users to do whatever it takes to get to the all-star status. The result for LinkedIn is higher engagement levels and more interaction on the site. One of the most common goals on a website is to get users to join a mailing list or download something. The idea, of course, is to gain the user’s email address. When you see the progress bar, it encourages you to complete the signup process. Yep, you can add actual games too. Why not? Like I said at the beginning of this article, humans love games. Even if the game doesn’t have much to do with your content or product, it will still keep people engaged with your site. More engagement, regardless of the reason, is a good thing. Build a mini game instead of a normal blog post. This doesn’t need to be anything complicated. Just create a small game, and see what happens to traffic and engagement. Blue Fountain Media added a game to their 404 page. And seriously, who doesn’t want to play a rousing round of Pac-Man? It even has 8-bit sound! Hey, what about your 500 page? Don’t let it get left out of the games! If you’re not careful, you can squander a solid fifteen minutes making that guy jump. Google has implemented its fair share of games over the years. Gamification is no doubt an effective way to enhance your content and increase audience engagement. It’s even been found to boost conversions up to 7x! By experimenting with various techniques, you should be able to pull more of your audience in and motivate them to engage more frequently and on a deeper level. Is there a specific gamification technique you’ve had success with? Is there one you’d like to try?